Research offers hope for a better future. Through research, we can advance the understanding of pancreatic cancer and bring new treatments to patients as soon as possible. Our centre combines the surgical expertise at Vancouver General Hospital with the cancer expertise of the BC Cancer Agency. Our surgeons treat more than 90 pancreatic cancer patients each year. The oncologists at the BC Cancer Agency specialize in providing cancer care needed by patients in addition to or in place of surgery. Thanks to the support of donors, we have the opportunity to move our research to a new level. We have five core components that support our research. The BC Gastrointestinal and Pancreatic (GIP) Biobank will enable us to build up a large collection of samples, including tissue and blood, donated from people with pancreatic disease. The Biobank also collects some information about the health and treatment of each person. This is a valuable resource for research into pancreatic disease, including the causes, development, diagnosis and treatment. Our scientists focus on several areas of laboratory-based (basic science) research. These include pancreatic tumour xenografts, nanotechnology and drug development. We also collaborate on genomic profiling with the BC Cancer Agency’s Genome Science Centre, the Centre for Translational and Applied Genomics and Simon Fraser University. We are taking advantage of the tissue samples and patient outcomes data collected over the past 30 years by Vancouver General Hospital and the BC Cancer Agency to build a microarray. A tool for genetic research, this will help our scientists look for biomarkers (information found in the cells or fluids of the body) that can be used to develop new tests to diagnose pancreatic cancer as early as possible. The BC Cancer Agency's Clinical Trials Unit has made a major impact in clinical research around the world. We are one of the national leaders in pancreatic cancer clinical trials and drug research. Clinical trials, which bring newly developed treatments to patients, are an essential part of developing new ways to treat cancer. We recognize the potential to learn more about pancreatic cancer from our patients. Based on tissue samples, we have created a comprehensive and powerful database to help us study pancreatic cancer at the cellular level. This can provide valuable information about the relationship between the nature of the cancer and its impact on the patient. Ultimately, this unit will help us to identify new treatments and make them available to patients as soon as possible. The Biobank is enabling us to build a large collection of samples, including tissue and blood, donated from people with pancreatic diseases. The Biobank also collects information about the health and treatment of each person. This is a valuable resource for research into pancreatic diseases, including the causes, development, diagnosis and treatment. Researchers can apply to the Biobank for samples and information to use in a pancreatic disease research project. Before material is released for research, each project must be formally reviewed. Researchers do not receive any personal information about the people who donate samples to the Biobank. We invite anyone with pancreatic disease treated at participating centres to become donors. Participation is entirely voluntary. We encourage potential donors to speak to their families and/or friends before deciding to take part. When pancreatic surgery is performed, the tissue removed is examined by a pathologist. The remainder is either stored in the Pathology Department or discarded. 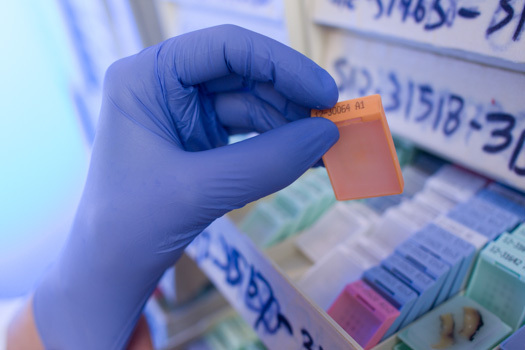 If a patient is interested in donating to the Biobank, we collect and store small samples of tissue that are not needed. We also gather blood samples from the donor, as well as information from their health records that will be useful for future research. The Biobank solely supports pancreatic research. The samples and information are used to improve our understanding of pancreatic disease and help patients in the future. If you are interested in taking part in the Biobank or if you would like further details about the GIP Biobank, please ask your doctor or research study coordinator. If you decide to participate, you will also be asked to sign a consent form. Pancreas Centre BC IDEAS Grants are designed to support investigator-initiated, high-impact and innovative pancreatic cancer research projects in British Columbia, Canada, that have the potential to significantly impact the lives of pancreatic cancer patients. Projects may include basic science, translational or clinical research. To apply, applicants must complete and submit an IDEAS Grant proposal that meets the criteria listed below. Complete applications will be reviewed by the Pancreas Centre BC Research Advisory Committee (RAC). Funding decisions will be made by the Pancreas Centre BC Steering Committee based on RAC recommendations. The IDEAS Grants are open to researchers in British Columbia engaged in pancreatic cancer research. Researchers include any individual with a M.D. or Ph.D. degree. The principal applicant must be an independent researcher with an academic or research appointment at a university or research institution in British Columbia. Co-applicants may include trainees, including post-doctoral fellows, research associates, clinical fellows and residents. The proposals will be reviewed based on the following criteria: innovation, collaboration, research team and potential impact on pancreatic cancer detection and treatment. Current IDEAS grant holders are not eligible to apply. Grant budgets may be up to a total of $100,000 total for a maximum of 2 years. Eligible funding requests include salaries for trainees, students or technicians/assistants and consumables. Ineligible funding requests include salaries for faculty/PIs, travel, meeting and catering expenses as well as direct patient care expenses. Applications must be written using the following formatting: Times New Roman Size 11 font, single spaced, with minimum 2 cm page margins. Applications that do not adhere to these formatting requirements may be withdrawn. In the top right hand corner of each page (header), please include the FIRST and LAST name of the principal investigator. Include the LAST name of the principal investigator in the title of the submitted document. Proposals must be submitted electronically in PDF format as one document. Proposals must be sent to Sarah Howard (sarah.howard@bccancer.bc.ca) by the deadline. Applications using core resources of Pancreas Centre BC (e.g. tissue microarrays, patient-derived xenografts, biobank samples) are encouraged to contact Dr. David Schaeffer (david.schaeffer@vch.ca) prior to making a submission to ensure that activities using these resources are coordinated. Unfortunately most pancreatic cancer patients tend to have poor outcomes. Surgery is the mainstay of treatment, but even for patients where the tumor has been surgically removed, there is a poor chance for survival because the cancer returns. Our aim is to develop an immune-based pancreatic cancer treatment that will reduce the chance of cancer recurrence. While the ability of the immune system to recognize cancer cells as non-self due to their underlying mutations is well known, established tumors can suppress these natural immune responses, or the immune responses can fail to activate in the first place. Recent advances have provided methods to expand and purify anti-cancer immune cells from blood, and deliver these immune cells to patients as therapy. In this proposal we will test the feasibility and reliability of isolating immune cells that recognize a common pancreatic cancer mutation, in a gene called KRAS, and we will evaluate the ability of these immune cells to kill pancreatic cancer cells. These pilot experiments will generate essential data that will inform the next critical steps of preclinical development for this type of cancer immunotherapy. Click here to read more about Rob Holt and his research. The public has an enormous stake in knowing whether excessive levels of insulin play a role in cancer. Current health recommendations advocate for diets that lead to relatively high levels of insulin. Millions of people depend on insulin as a treatment for the life threatening complications of diabetes. The epidemiological approaches used to date are unable to isolate the effects of insulin or identify the molecular mechanisms. The innovative mouse model we have developed is the only tool available that can specifically and directly test the hypothesis that insulin itself is involved in cancer. The results of our study will have immediate and profound ramifications. Information on the molecular mechanisms of insulin action may also be used to design a new class of selective compounds to kill pancreatic cancer cells, without affecting normal cells of the pancreas. Our ultimate goal is to see the day when a diagnosis of pancreatic cancer can be associated with hope for a full recovery. Click here to read more about James Johnson and his research. Pancreatic cancer is the fourth leading cause of cancer-related deaths in Canada. There are many types of pancreatic cancer, but pancreatic ductal adenocarcinoma (PDAC) is the most common (95% of all cases). This cancer has often been called the “silent killer” because it often does not cause symptoms until very late stages of the disease. At this point, treatment options are limited because the tumor is very resistant to chemotherapy and surgery is not an option. To improve the outcome of this disease, we need to better understand what causes it and how it develops so that we can develop better tools to recognize the PDAC earlier. To begin to understand this disease better, we have developed new mouse models to examine which cell type initiates PDAC and how tumors arising from different cell types contribute to the development of variation, or heterogeneity, between patients. In the proposed research, we will specifically examine whether each cell type requires a different set of genetic changes to initiate PDAC. Differences identified by these studies may be used in the future to distinguish which cell type initiates PDAC in patients and predict response to therapy and differences in survival. Altogether, these studies will examine the impact of early tumor-initiating events on PDAC heterogeneity and their contribution to differences in clinical outcomes for patients. Click here to read more about Janel Kopp and her research. The survival rate for pancreatic cancer patients at 5 years is less than 6%, making it one of the deadliest forms of cancer. New approaches to treat pancreatic cancer are urgently needed. Cancer immunotherapy is a type of treatment that harnesses the immune system to fight cancer. One form of cancer immunotherapy called adoptive T cell therapy involves collecting immune cells (called T cells) from a patient’s tumor and growing them in the laboratory. These T cells are then infused back into the patient with the expectation that they seek out and destroy tumor cells. The goal of this study is to develop optimized procedures for growing T cells that can specifically target pancreatic tumors. We will use cutting-edge genomic sequencing technology to assist us in determining the best methodologies for adoptive T cell therapy. Our work will utilize the resources and patient samples of the Pancreas Centre BC. We expect that the outcome of our study will help facilitate moving towards a clinical trial of adoptive T cell therapy for pancreatic cancer patients within the next few years. Click here to read more about Julian Lum and his research. Genetic analysis of pancreatic cancer highlights that this cancer differs from patient to patient and actually represents a number of different diseases. This complexity suggests that treatments should be better tailored to a patient’s specific disease; something that is referred to as personalized therapy. However, the problem is even more complex. Genetic differences are also seen in different areas within a single tumor isolated from a patient. It is precisely because of this complexity that we believe that effective treatments for patients with pancreatic cancer will continue to rely on use of agents that broadly target cancer cells regardless of differences in their genetic makeup. Our research is defining methods that will increase delivery of broad spectrum drugs to pancreatic cancers. Our lab develops drug carrier systems that are 100 times smaller than red blood cells; drug carriers that can be safely administered to patients. This research proposes to create new formulations of a drug that was previously used to treat malaria. In the context of pancreatic cancer, our team believes that this “old” drug can be repurposed into a “new” drug that has the potential to affect the ability of pancreatic cancer cells to survive. It should be active when used alone but will be more effective when used in combination with a drug call gemcitabine. Gemcitabine is a broad spectrum drug used to treat patients with pancreatic cancer. We will test these formulations in many different mouse models of pancreatic cancer as it is understood that therapeutic benefits seen in multiple models are most predictive of therapeutic benefits in patients. Click here to read more about Marcel Bally and his research. Pancreatic cancer remains one of the most difficult cancers to treat with very high rates of mortality. One of the major reasons for this is the unique tumor microenvironment of pancreatic tumors which have extensive regions of hypoxia (low oxygen levels) due to low blood supply, and a dense network of cells surrounding the tumor, called stroma and extracellular matrix, resulting in resistance to chemotherapy agents. We have identified two molecular targets, Carbonic Anhydrase IX (CAIX), and Integrin-Linked Kinase (ILK) which play an important role in mediating the effects of hypoxia and the formation of extracellular matrix, respectively. Preliminary investigations have demonstrated that both of these proteins are expressed at high levels in pancreatic tumors, and may indicate poor patient prognosis. Importantly, we have developed highly specific inhibitor compounds that block the activity of these proteins leading to the inhibition of tumor growth. In this project, we propose to test these compounds in pancreatic tumor models to determine their utility in inhibiting pancreatic tumor progression in combination with chemotherapy agents such as gemcitibine. The specific aims are to : 1) Evaluate a large Tumor Microarray (TMA) to determine the level of expression of CAIX and ILK in pancreatic tumor samples, and determine whether they predict patient outcome and prognosis; 2) Evaluate the efficacy of the CAIX inhibitor (U-104) , and the ILK inhibitor (QLT-0267) in xenograft animal models of pancreatic tumor growth, and 3) Evaluate the role of the interactions between pancreatic tumor cells and cancer-associated fibroblasts (CAFs) in normoxia, a state of normal oxygen levels, and hypoxia, and determine how these interactions promote tumor growth. These studies will determine the roles of these proteins in pancreatic tumor progression, and have the potential in the long term to identify novel therapeutic strategies to treat pancreatic cancer. Click here to read more about Shoukat Dedhar and his research. Among the various types of cancer, pancreatic cancer is one of the most difficult to treat and is one of the leading causes of cancer-related deaths. The aim of this research project is to evaluate a new combination approach to kill pancreatic cancer cells. This strategy targets two cellular processes involved in the development and treatment response of pancreatic cancer: autophagy, a process by which cells self-digest, and the metabolism of the amino acid glutamine. Autophagy enables cells to adapt to stress and helps cells to remove damaged intracellular structures that could otherwise kill them. Likewise, cancer cells also use the autophagy process to remove the damage produced by anticancer treatments and to support survival. Recent studies have shown that glutamine deprivation can also induce autophagy as a survival response. Glutamine is an important nutrient that supports many functions in normal tissue, but that is also used by cancer cells to grow rapidly and counteract anticancer treatment. By targeting these two survival processes in combination, our aim is to exploit inter-related vulnerabilities of pancreatic cancer cells. This study will be the first to examine the use of this novel strategy against pancreatic cancer. Click here to read more about Sharon Gorski and her research. The challenge in treating pancreatic cancer: Pancreatic cancer has poor clinical outcome, due in part to a lack of drugs that can effectively kill the cancer cells. It is apparent that not all patients will respond to the same types of drugs or drug combinations. A vision of personalized medicine: To tailor medical intervention to every patient is a lofty goal and presents many challenges. Generally, studies in personalized medicine will attempt to identify tumor markers that will indicate which therapies are suitable for that individual. We are proposing to tackle this problem in a different way – taking tumors from the patients and treating them with various drugs to see which drugs are most effective. A new model system: Transplantation of patient tumors into mice to evaluate drug response has been successful in the past, however, these experiments are lengthy and expensive. We propose an alternative model system – the zebrafish transplant model system. Patient tumor cells are injected into the yolk sac of 2 day old zebrafish, which are then treated with various drugs over a period of four days. This model is rapid and cost-effective compared to mouse models. Since it has never been used for personalized medicine before, one goal of these studies will be to optimize the zebrafish transplantation model system. The ultimate goal is to create a pipeline through which patient tumors can be tested for drug sensitivity so that treatment decisions can be made in real time, therefore impacting the survival rates of pancreatic cancer patients. Click here to read more about David Huntsman and his research. Pancreatic cancer is notoriously resistant to chemotherapy. Basic research has revealed that pancreatic cancer cells use a process called autophagy for their growth and to survive chemotherapy. Very few autophagy inhibitors are known and only two are suitable for human use. Both act at a late stage in the autophagy process and work only at high concentrations that cause too many side effects. Our aim is to discover new and more potent inhibitors that act on early stages of autophagy and to evaluate their potential for development into drugs that act alone or in combination with existing chemotherapy to kill pancreatic cancer cells. We have developed the first cell-based assay to detect autophagy inhibitors. We will test ~30,000 chemicals in this assay. Those that inhibit autophagy will be evaluated for their potency in killing or arresting the growth of human pancreatic cancer cells, for their lack of toxicity against normal cells, and for their solubility and drug-like properties. Click here to read more about Michel Roberge and his research. Pancreatic ductal adenocarcinoma (PDAC) is an aggressive malignancy with a 5-year survival of < 5%. Interestingly, these tumours contain a large stromal component, a dense network of cells forming the connective tissue, which can comprise up to 90% of the tumour. Tumour-associated stroma provides a microenvironment to support tumour growth and progression, and has been shown to significantly hamper effective treatment of these cancers. The PDAC-associated stroma is hypothesized to derive from pancreatic stellate cells, which represent tissue resident mesenchymal stroma cells (MSCs). During our studies related to MSC biology, we have discovered a cellular program that appears to be important in regulating MSC activation and cell-cycle entry. The overall objective of this project is to better understand the functional role of this program involving two tumour suppressor proteins in pancreatic cancer progression and stroma. These two proteins are normally expressed in MSC/stellate cells within the pancreas, and their expression is decreased in activated MSCs. We hypothesize that deletion of either tumour suppressor protein in pancreatic stellate cells will create an environment conducive for PDAC development and progression. Our approach will utilize novel in vivo mouse genetic models to manipulate expression of the tumour suppressor proteins. Collectively, this research plan will enable us to answer several questions regarding the contribution and fate of activated MSCs in the pancreas, enabling us to identify novel mechanisms for targeting the activated stroma in pancreatic cancer. Click here to read more about Michael Underhill and his research. Since Pancreas Centre BC was founded in 2012, researchers affiliated with the Centre have made significant contributions to pancreatic research. A list of publications is below. Please click on the title of the publication to be linked to the abstract for more details. Ductal pancreatic cancer modeling and drug screening using human pluripotent stem cell and patient-derived tumour organoids. The involvement of insulin-like growth factor 2 binding protein 3 (IMP3) in pancreatic cancer cell migration, invasion, and adhesion. Mismatch repair status may predict response to adjuvant chemotherapy in resectable pancreatic ductal adenocarcinoma. Tumor budding is an independent adverse prognostic factor in pancreatic ductal adenocarcinoma. Eligibility of metastatic pancreatic cancer patients for first-line palliative intent nab-Paclitaxel plus gemcitabine versus FOLFIRINOX . Defining Eligibility of FOLFIRINOX for First-Line Metastatic Pancreatic Adenocarcinoma (MPC) in the Province of British Columbia: A Population-based Retrospective Study. Gastrointestinal Endoscopic Ultrasound-Guided Fine-Needle Aspiration Biopsy Specimens: Adequate Diagnostic Yield and Accuracy Can Be Achieved without On-Site Evaluation inoma (MPC) in the Province of British Columbia: A Population-based Retrospective Study. A Phase II Study of Erlotinib in Gemcitabine Refractory Advanced Pancreatic Cancer. New insights into the cell lineage of pancreatic ductal adenocarcinoma: evidence for tumor stem cells in premalignant lesions? A practical guide to genetic engineering of pancreatic β-cells in vivo: getting a grip on RIP and MIP. Large pancreatic mass in a young woman. A phase I/II study of the Src inhibitor saracatinib (AZD0530) in combination with gemcitabine in advanced pancreatic cancer. A phase II study of the halichondrin B analog eribulin mesylate in gemcitabine refractory advanced pancreatic cancer. The FPCP aims to determine the benefit of currently available screening methods and is actively involved in the development of an investigational pancreatic cancer screening protocol. All patients with a diagnosis of PDAC (pancreatic ductal adenocarcinoma) are eligible for a referral to the FPCP regardless of family history. Only about 5-10% of all cancers are due to an inherited genetic change or mutation. Research has identified the genes linked to specific patterns of cancer in some families (e.g. BRCA1 or BRCA2 for hereditary breast/ovarian cancer, MLH1 or MSH2 for Lynch syndrome, and others). In the general population, the lifetime risk of developing pancreatic cancer is about 1.5% (or 1 in 79) for both men and women. The main risk factors for pancreatic cancer include: age, smoking, a prior history of pancreatitis, obesity and family history of pancreatic cancer. Adopting a healthy lifestyle may help minimize your risk of developing cancer. Familial pancreatic cancer is typically defined by the presence of two or more first-degree relatives (mother, father, brother or sister) with pancreatic cancer. In general, individuals who have one first-degree relative diagnosed with pancreatic cancer have approximately 2-3 times the increased risk compared to the general population. This means these individuals have about a 4% risk of developing pancreatic cancer over a lifetime. Genetic counselling is available via referral to the Hereditary Cancer Program for people with familial pancreatic cancer and/or a significant history of cancer in their family. In-person appointments are currently provided in Vancouver, Victoria, Surrey, Kelowna, Abbotsford, and Prince George. Video-conference appointments are booked in many other communities, across BC/Yukon. Click here for additional information about the Hereditary Cancer Program.